Be the first to ride this brand new track!! This event is being run as a special date run at the new facility in Canaan. The track is a ton a fun, and we will try running it in both directions, plus we'll have a pit bike/scooter/mini moto session at the end of the day on the special short (and tight) configuration of the course. We are even looking at doing some mini moto dirt drills. While there will definitely be instruction available that riders traditionally find at Penguin events, this date will have some fun twists thrown in to create a super fun & casual atmosphere. If you have a pit bike with either dirt or street wheels - bring it! This track day will have plenty of laughs mixed in with the riding. Learn the course in both directions! 1/2 Day Motard Rentals - If you've ever wanted to try a Motard bike, this is your chance! This track is perfect for them! Rental Equipment: Motorcycles & equipment may be rented for both the school and racing and we strongly recommend reserving in advance as items can sell out. Click here for full information on rental equipment. We have a License Certification, Advanced Rider Training and Track Day Class scheduled for both these days. 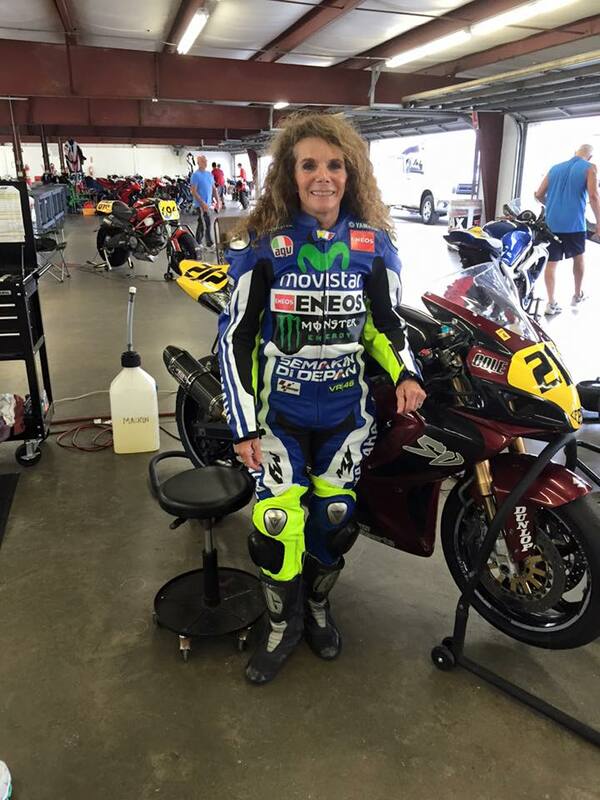 If any of you have been thinking about riding the track with Penguin - meet Dotti Aiello, who at 65 years young had a great day with us riding one of our rental Ninja 300's. This fantastic lady had her initial fears completely put to rest by her 2nd session on the track, and was smiling more and more each time she got off the bike. What's your excuse?!? "Just wanted to give you some feedback from Monday’s Track Day. Thank you for a great day! You and your crew were very professional and courteous. Excellent instructors as well as all the other riders. My daughter Brooke, had a great time and came away with much more confidence. She was a bit nervous at first, but her confidence grew as the day progressed. Steve, her instructor, was great! What a down to earth nice guy and motorcycle enthusiast. He spent quality one on one time with her and it really helped. Being only 16 and having limited street bike experience was the biggest reason I signed her up for your school. She really enjoyed her time there. Steve kept encouraging her throughout the day and it paid off with faster and faster lap times. She wants to come back for more experience. We will try to get back this season, but if not, definitely next spring. Thanks again!"